Getting the Best Results From Sublimation » Embroidery Talk Has Moved! Sublimation can be a great profit center for almost any garment decoration or souvenir or gift shop business, but there are things you need to know in order to get the best results from your sublimation products. Getting your printer and your inks and all your sublimatable blanks is only half the task. Once you’ve got them, you need to know how to use these products to their fullest advantage. Today, I wanted to share a few tips to help you do just that. Tip 1: Remove the protective film carefully – Most sublimatable blanks are covered with a plastic film which keeps the surface from being marred or scratched. Do not pick at the plastic covering with a fingernail or sharp object in a effort to remove it. The best way to remove the film and reduce the risk of damage to the unprinted substrate is to use something like tape with a sticky side to pull the adhesive from the blank. If you don’t have any tape, use the pad of your thumb or forefinger to peel back the edge of the plastic. Do not use anything sharp as this could nick or leave gouges in the substrate. Tip 2: Add a “bleed” to your artwork – Enlarge your artwork so it is 1/16″ to 1/8″ larger than the blank you will be sublimating. Align your blank by placing it face down over the transfer. When you can see an even amount of ink on all sides of the transfers, then the blank is properly aligned. Hold the transfer in position by folding two sides of the transfer over the back of the sublimatable blank and securing it with heat resistant tape. Tip 3: Avoid “blowouts” – “Blowout” is a reference to an image that has colors which have “blown out” of the borders of the design and appear smudged. Blowouts are generally caused by uneven heating, excessive pressure or overheating. To avoid this issue, use a Teflon pad to cover your transfer and lessen the variations in temperature. Tip 4: How to store finished product – Do not place sublimated products in direct contact with each other or with any other synthetic product. The inks will migrate from the substrate to the synthetic material as time passes. There is also the risk of scratching the substrate. 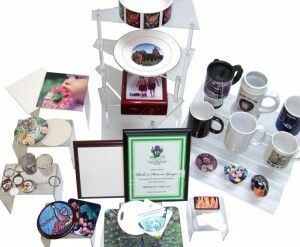 It is recommended that you store sublimated items with a piece of paper inserted between each item. This will help eliminate ink migration and the reduce the potential for scratches. This entry was posted on Tuesday, September 15th, 2009 at 10:59 am and is filed under Sublimation. You can follow any responses to this entry through the RSS 2.0 feed. Both comments and pings are currently closed. I purchased some mugs and a wrap a while ago from enmart and made my first attempt today with a small convection oven. For my first run I was pretty happy but the letters on the mug were a little blurred at the edges. Am I cooking it too hot, to long not long enough not hot enough? I did 400 degrees for 15 minutes in a preheated oven. Also I wonder if the wrap is tight enough but I don’t know how to make it tighter. There isn’t a screw or anything and thank goodness for my dad who happened to be around or I wouldn’t have been able to figure out how to use it. Any tips? I have a job for a church if I can figure this out Thanks! Kim, I did have Bill, one of our sublimation experts, reply to your question. I hope the tips he gave you helped. hi, im having a similar problem to kim on some of my mugs, sometimes it smudges around the edges, mostly the bottom. at first i thaught maybe the mugs are tapered (angled) in slightly, but still im not sure how to fix the problem. I put the mugs in the mug press at 200 degrees for 4 minutes.